The Marches Deli (Monmouth) at The Marches Delicatessen (Monmouth)(01600) 228 090work DelicatessenThe delicatessen showcases a selection of fine artisan foods as well as some favourite beers, wines and spirits from across Monmouthshire and the Marches region. The majority of our food is sourced directly from producers. This allows us to see firsthand the passion and dedication which goes into making the exceptional produce we sell. The delicatessen showcases a selection of fine artisan foods as well as some favourite beers, wines and spirits from across Monmouthshire and the Marches region. The majority of our food is sourced directly from producers. This allows us to see firsthand the passion and dedication which goes into making the exceptional produce we sell. With a wide range of artisan produce from Monmouthshire and the surrounding area you can be sure there is always something new to try. 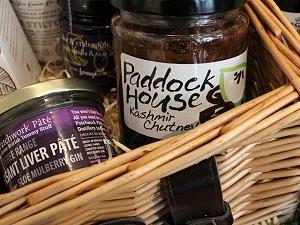 Why not order one of our gift hampers full of all your favourites? Or sit back and relax in our Monmouth coffee shop and sample some of our cheese or meats before you take home.